the peas I grow are tall heritage ones from Victoriana Nursery, they grow 8ft, I have a couple of unused small polytunnel frames that are covered with netting, I grow peas up these, the frames can be moved to whichever bed I am using, I dont like dwarf peas, they take up the same ground space but you get less returns. Space isn't such an issue here, although that said I never grow many peas normally, we love them though so I'm making more of an effort this year. A roll of chicken wire, if you have any lying about, attached to your metal bars might do the trick instead of the string. Good idea! I might have to change it for that. I use those "hog panels"--4 ft high, 16 ft long cut in half to make two 8 ft tall panels. My sugar snaps generally grow to 6 foot tall. I think your idea is clever and should work very well. We have growm Alderman pea before, up canes. Lovely flavour. Growing dwarf ones this year though. I just have a small backyard garden and I've never grown peas before but I'm growing beans this year. The chicken wire sounds like a good idea. The problem with metal posts & mesh is that they can get very hot in a spell of good weather & damage the plants on them. 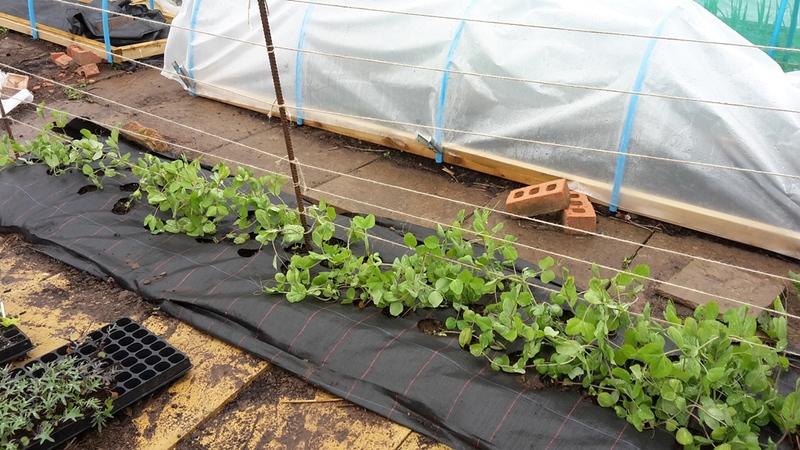 Plastic mesh is kinder to plants. 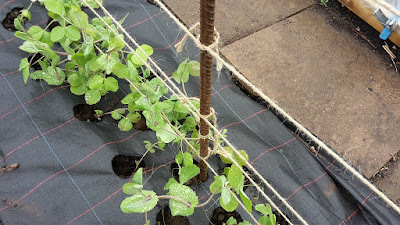 I use plastic bean mesh (square mesh) usually bought from a Pound shop & hang it over a cane cross bar supported at each end between two crossed upright canes & cable-tied in place for stability . Each end of the mesh is tent pegged into the soil (pegs also from the Pound shop). This speedily put up frame is about 4-5 ft tall & double sided for two 4ft rows of peas. I also grow 7ft yellow podded mangetout peas up bean mesh wrapped around a cane teepee (cable-tied at the top for speed).